Will Leaving Liverpool Help Ibe Progress? 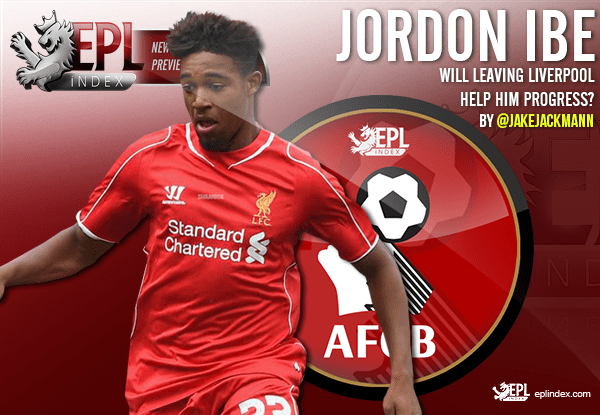 EPL Index > Bournemouth > Will Leaving Liverpool Help Ibe Progress? Jordon Ibe is now 20 and he will be looking for first team football to develop further. Last season, he played 41 times for Liverpool, 20 of which were starts, but his level of performance wasn’t good enough to gain a starting berth under Jurgen Klopp. The addition of Sadio Mane and the return of Lazar Markovic will increase competition for the attacking places, while Philippe Coutinho and Roberto Firmino are already ahead of Ibe in the pecking order. They may have been looking for a loan spell for their young winger, but a £15m bid from Bournemouth was too good to turn down and Ibe is set to be playing at Dean Court next season. The winger made headlines when he scored on his first senior start while at Wycombe Wanderers and it was his performances as a 15 year old that alerted Liverpool to him. There were a lot of clubs interested in him, but Liverpool hoped that he would follow in the footsteps of Raheem Sterling, with the two having similar skill sets. Despite two decent loan spells and some good cameos in the Liverpool first team, he hasn’t developed as quickly as first hoped. At the age of 20, he is still young, but he needs regular football to develop further, which he will get under Eddie Howe. In the England set up now, there are plenty of examples of players at top clubs that needed to take a step down before gaining a regular place at their parent clubs. Jack Wilshere and Daniel Sturridge both excelled at Bolton, while Joe Hart had a great loan spell at Birmingham City before becoming Manchester City number one. Jordon Ibe is at that stage now where he needs an important role in a Premier League side, and that was unlikely to come at Liverpool. Although he isn’t going out on loan like the players mentioned above, he can make similar progress and an England role in the future is well within his ability. There are a number of areas of his game that he needs to improve before being good enough for a top side. His defensive contribution is weak, and that is crucial for a winger in the modern game. Ibe also needs to improve his final product, both in terms of quality and decision making. That will come with experience and the right coaching. A move to Bournemouth will provide him with both, as he will be a regular and Eddie Howe is well thought of in the game. He showed flashes of brilliance last season, with the matches Bournemouth, Watford and West Brom during the run in standing out. They were the exceptions rather than the rule and he needs to perform at that level more consistently. He has the raw physical attributes to be a dangerous winger in the top flight. His pace, and burst of acceleration will cause defenders problems. This, when coupled with his impressive strength, makes him a force to be reckoned with, capable of beating players with ease when on form. He also likes to take responsibility on the pitch and doesn’t hide away when things aren’t going his way, which shows an impressive mentality. He has the tools to go to the very top of the game, but the right environment to develop in. The move to Bournemouth is interesting if it goes through and could prove to be a great career step, even they are a less prestigious club than Liverpool. The bid of £15m proved to be too much for Liverpool to turn down, although they do think a lot of the player. Bournemouth needed a new winger, especially after they sold Matt Ritchie and have made Ibe their priority target, which will boost his confidence. He will be an important part of their side and could develop quickly over the next 12 months. ibe can kiss goodbye to any progress in his career where a football is involved. No club can help this one-trick pony progress further. However, there is every possibility that Ibe can be trained to run a little faster. He should, therefore, seek out a good athletics coach rather than ponder over which football club to join. Categories: Bournemouth, EPL Index Featured Article, EPL Transfer Analysis, Liverpool, and Liverpool (NN).' 'Tags: AFC Bournemouth, coutinho, english Premier league, English Premier League Opta Stats, Jordon Ibe, LFC, LFC Stats, Liverpool, Liverpool (NN), Mane, Markovic, opta, Opta Stats, premier league, premier league opta stats, and Premier League Stats.